Would you Buy a Home Without Ever Seeing it in Person? Would you buy an engagement ring without seeing the diamond? Even with today’s technologies that give you an idea of what you are looking at, it just isn’t the same as seeing it with your own eyes. So why on earth would you purchase a property and not have ahome inspection? Isn’t it the same as buying it without seeing it? The home inspection can uncover items that may not be visible on a video stream or even in person, sometimes. Especially if there is radon, termites, moisture or air leak issues, wouldn’t you want to know before moving your family into the place? So, the inspector has been to the property and discovered there are drainage issues. What does this mean? Well, for starters, if water is not properly draining away from the home, this means the water is settling somewhere within the home, most likely the basement or crawlspace. Why is this important to note? Not because we don’t want the deal to follow through, but because we as inspectors do not want to see the client subjected to one of the leading promoters of mold growth. After all, nobody wants to inhale mold spores for an extended period of time (at least not that I am aware of). Mold, according to the CDC (center for disease control) causes noted symptoms in otherwise healthy adults and children. There is ” sufficient evidence to link indoor exposure to mold with upper respiratory tract symptoms, cough, and wheeze in otherwise healthy people; with asthma symptoms in people with asthma; and with hypersensitivity pneumonitis in individuals susceptible to that immune-mediated condition” (CDC.gov). Since mold thrives in damp, humid atmospheres, it is a good idea to find out in advance if the home you wish to purchase has a drainage issue that will promote mold growth which could lead to serious health issues. While detection of water intrusion may be a game changer, it is not always a deal breaker. There are solutions to issues that arise. Sometimes all that is needed is a better ventilation system or a change in humidity level. Small changes can help eliminate the risk – such as not carpeting lower level areas. Drainage issues can sometimes be fixed by landscaping around the home. By grading around the home, this will shift the surface water. Sometimes, it is imperative to place a barrier in the water shedding layer of the soil to route the drainage in the proper direction away from the home. Sloping away from the home’s foundation is the key. If the water is within the walls, then they most likely will need removed and replaced in order to prevent the growth of mold. Also, a professional waterproofing company may be able to assist in warding off any further water damage. There are 4 Types of Interior Waterproofing and a professional can help determine which type of drainage issue may be present and which type of interior or exterior waterproofing may be needed. RecallChek Services are Free with every IHI home inspection! Your family’s safety is one of the Atlanta Home Inspector’s top priorities. One way we provide peace of mind is through the service of RecallChek. This service checks model and serial number information against a database of recalled appliances and alerts clients as well as agent of any new recalls that occur. The service is FREE. It is also provided for a lifetime. Even when you purchase a new appliance, you can still receive the monthly reports. By providing the new appliance model and serial RecallChek will begin checking it for any recalls, as well. Faulty heating equipment resulted in 1,520 civilian injuries, and $1.1 billion in direct property damage in the last few years, according to the National Fire Protection Associaton. Our nation recorded approximately 6.5 recalls each day, according to studies conducted by Consumer Product Safety Commission and the Food and Drug Administration. Be sure to ask if your home inspector provides this or a similar service to help protect your family and your investment. In the past, clients who chose to build new homes were concerned with specific details that would help them maintain a steady resale value down the road. For instance, the average styles, textures, and colors were requested, which reflected the trends of the time. However, we all know that trends come and go; think bell-bottoms, big hair, and bobby socks all of which were trendy to different eras and cherished by different generations. Today, the top priority of new home construction clients may surprise some, because it is not about color variation or popular appliance brands. It isn’t even about how pretty the house looks when seen from the curb. According to the NAHB Housing and Economic Policy Group, a 2012 survey indicated that the home buyers’ top priority was energy efficiency. What were the two most requested items on new construction homes? Energy smart windows and Energy Star appliances. What were the least requested items in new constructions? Laundry chutes, wine coolers, and outdoor kitchens (Kavjian, M., Aug. 2013. NAHB. Best in American Living.). In Atlanta, we see an increase in new home constructions, and have completed several inspection services on newly constructed homes. Remember, it is important to have a home inspected regardless of age, because even the newly built homes can be flawed. The most common issue discovered on new constructions by the Atlanta home inspection team is roof related, whether shingles are not attached properly, are not fully installed or are gapping in places, it is our priority to gather the clues for the home buyers’ so they can ensure their new home is precisely what they want it to be. Those of you who handle newly constructed properties, what do you see as the latest “must-haves” of your market? Are clients more concerned with function or appearance? Moisture levels – Moisture levels underneath a home can help the Atlanta Home Inspector uncover issues from inside the home. For instance, if there are signs of water damage below the area where the refrigerator sits, this could be an indication of a water line leak. Other important areas are underneath the toilets, sinks, tubs and showers – anywhere there could be a sealing or plumbing issue. However, moisture issues in the crawlspace are not limited to a leak. It could mean that the area just isn’t properly ventilated. This is a key element in the inspection, because a high moisture level contributes to wood rot and promotes the growth of mold and mildew. Span and load is the support system of the home. Buckling, breaking or rotting support systems can fail due to an elevated moisture level. Electrical – There should not be any loose wires dangling or strewn about within the crawlspace. Junction boxes should not be open and all wires should be properly contained. Loose, exposed wiring can not only electrocute someone, but possibly start a fire. Ductwork – Ductwork should be properly connected and supported. There should not be any kinks or binds in the connections to ensure proper airflow throughout the system. Also, the ductwork should be in place and not hanging, bulging, or gaping open. Wildlife – Wildlife evidence can be found underneath homes. Sometimes, the wildlife itself is found. Bugs that can threaten the structure of the home can be found and also snakes are sometimes present. These are just a few of the items the Atlanta Home Inspection team will search for at your property. Remember it is important to be armed with information so that you and your client can make the best decisions moving forward. Call us today at 404-788-2581 for a thorough home inspection in Atlanta. We won’t let you buy the money pit. You can also schedule your Atlanta home inspection today online. We create Peace of Mind One Atlanta home inspection at a time. Be sure to check out all the other reasons other customers chose IHI Home Inspections at our original website. While nothing can compare to the emotion, the ambiance, or the restorative nature of the mountains, there are a few contrasts to consider regarding the composition of your log home retreat. • Look to see if there is any timber rot or any sort of past water damage. Make sure to check the top, ends, and corners of logs. • Fungus or mildew can appear on logs in dark streaks. Look for any indicators of this occurrence. • Check all of the logs for gaps, but remember that a little cracking of your house logs is to be expected. • Look for visible damage from insects, such as termites. Always look along the exterior walls, all of the overhanging roof trim, gable trim, and edges for little round holes made by carpenter bees, as well. • Check your porches and decks – it is extremely common to discover water damage and mold underneath porches and decks, particularly if the flashing has not been installed properly. Also check to see that decks and porches are attached properly. • Logs should not be touching the soil. A clearance of 12 inches would be recommended. • Interior and exterior doors will indicate shrinking log walls. If doors are opening and closing properly – walls have not decreased in size. • Rafters and framework especially where the roof surface area is situated on the log walls needs assessed to determine if there is at least a 18” or more overhang. If you need assistance determining these aspects of your log home, don’t hesitate to enlist the services of a North Georgia home inspector. The Atlanta Home Inspector will record the findings in a computerized report and provide you with pertinent information to help maintain the conditions of your mountain escape. Home inspections are not only important to us, but also to clients in the Atlanta subdivision of Le Grande. This prestigious John Weiland community boasts new design concepts and spacious living conveniently located for the daily commute. It is our privilege to exceed the expectations of our clients through exemplary service and attention to detail. We pride ourselves on informing clients and agents, so that the decision-making process is seamless. To see what we do visit our youtube video site at: http://http://www.youtube.com/user/ihihomeinspections?feature=guide . Le Grande Subdivision, a John Weiland Community in Atlanta! Space heaters are popular among homeowners in Atlanta because, as portable appliances, they can heat a small space quickly and inexpensively. It requires less energy to run a space heater than to raise the temperature of an entire home by a few degrees. However, space heaters can be dangerous, too. In its November 2011 report, the National Fire Protection Association reveals that heating equipment was involved in an estimated 58,900 home structure fires, 480 civilian deaths, 1,520 civilian injuries and more than $1.1 billion in damage. If you use space heaters, therefore, please remember to read (and follow) the manufacturer’s instructions for proper usage, and to obey basic safety standards. First, never place anything flammable within three feet of a space heater. Space heaters get very hot, very quickly and can ignite rugs, paper and curtains. Next, make sure your space heater is placed on the floor, on level ground. Do not rest it on books, or on furniture. Also, make sure to turn space heaters off when leaving a room, or when going to bed. 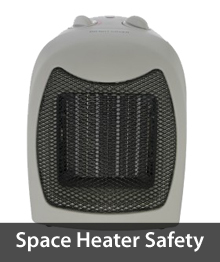 Space heaters are not meant to replace whole-home heating and should not be left unattended under any circumstance. The Underwriters Laboratory makes a list of general safety tips available on its website. Considering how much damage space heaters can cause, the list is worth committing to memory. Not everyone can walk on a roof. Let’s face it, some of us suffer vertigo, Acrophobia, or are just plain chicken. However, at IHI Home Inspections great pride is taken in roof top walking. Some home inspectors do not walk the roof. This means that they can only report those details that are seen from the ground. Here is a little hint… if it isn’t seen, then it isn’t put into the Inspection Report. Think about this for a moment – let’s say there was a hole the size of a quarter in a rooftop vent boot. This might sound like a very nit picky issue if you do not understand the consequences of this find. The significance, is that water, debris, and any other outside element, can get into this boot, and onto your roof, or into your attic. The water damage will cause your roof to rot. Do you suppose that a home inspector standing on the ground, would see such a detail? This is a little scary if you are buying a home. Make sure you and your real estate agent know your home inspection options before it is too late.